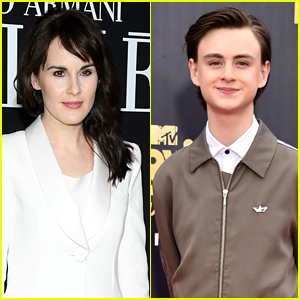 Michelle Dockery and Jaeden Martell are teaming up for Apple’s new limited series Defending Jacob! The 37-year-old Godless actress and the 16-year-old It actor (formerly known as Jaeden Lieberher) have both signed on for lead roles alongside Chris Evans, Variety reports. Defending Jacob is based on the 2012 best-selling book of the same title by William Landay. Michelle will play Laurie Barber, Andy’s wife and Jacob’s mother. The series was created, written, and executive produced by Mark Bomback, who will also serve as showrunner. Academy Award-nominee Morten Tyldum will executive produce and direct.